Burlington Arcade is a mix of silver, holographic glitter of various sizes and shapes in a clear base. There are also shards of glitter in this one and while usually, glitter shards are on my "no-go" list, I actually don't mind them in this polish. I think that's because they are smaller and lay flat on the nail. While I was swatching it, tt almost reminded me of one of the many "indie" glitter topcoats now available, simply because of the various sizes and shapes to the glitter. Although, it's nowhere near as chunky as some indie shard-glitter topcoats I've seen. Application on this one was perfect. 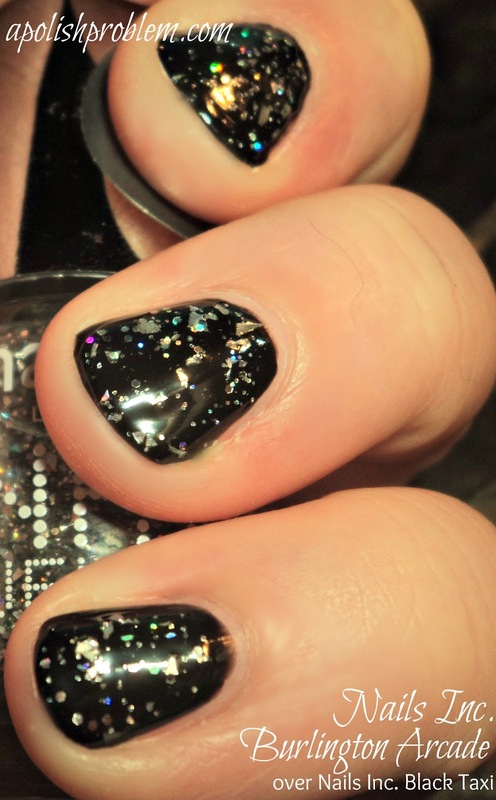 The polish flowed smoothly on the nail and there was no glitter-drag. I have seen swatches of the other polishes within the Nail Jewelry collection and it looks like it may be possible to almost reach opacity with the other colors. However, with Burlington Arcade, that is not the case. The above picture is 3 coats and I was nowhere near reaching opacity. I did like that it gave my natural nails a flash of shimmer, though. This is 3 coats of Burlington Arcade over 2 coats of Nails Inc Floral Street, an opaque, white creme. Believe it or not, as stunning as this was over Black Taxi, it was just as beautiful when layered over this saturated white. Unfortunately, in pictures this combination doesn't want to show off as much as Burlington Arcade + Black Taxi, but trust me... it is so, so pretty. It's also a much more subtle look (as subtle as you can get with holo, chunky glitter. LOL). I think you can guess, I absolutely love Burlington Arcade. The multitude of glitter sizes and shapes sets it apart from other silver holo glitter topcoats, in my opinion. I really liked it over black, but it was amazing over white. Because of this baby, I can't wait to try the Nail Jewelry in other colors. I've heard that Royal Arcade layered over Baker Street is especially gorgeous. You can find all 4 of the Nails Inc Nail Jewelry polishes at Sephora.com. Price is $9.50 for a 0.33 fl oz bottle. All polishes shown within this post were sent to me for review by Nails Inc's PR. The above link links to this product on Sephora.com and is not an affiliate link. I love this all 3 ways you showed it!!!! I am a sucker for black, so I would have to choose that my favorite! Absolutely loving this! I appreciate how you swatched it over dark and light polish. Helped me to see how it would look against my range of polishes. Thanks!